American chop suey, also known as goulash, is far from its Asian namesake. It's a mixture of ground beef, macaroni, and tomatoes, and it is one of America's favorite comfort foods. Extra garlic and tomatoes give this version an abundance of flavor. The green bell pepper is optional. This recipe makes a big batch, and the leftovers are delicious, too. Warm in the microwave, on the stovetop in a little butter or oil, or cover and warm in the oven. Drain in a colander and rinse under hot water. Set aside. In a large deep skillet or saucepan, heat the vegetable oil and butter over medium heat. Add the onion and bell pepper, if using. Cook, stirring until onion is softened and edges are lightly browned. Add the ground beef and cook, stirring and breaking up, until cooked through and no longer pink. Add the garlic and garlic powder and cook, stirring for 1 to 2 minutes longer. Stir in the crushed tomatoes and diced tomatoes, the tomato sauce and paste, sugar, and pepper. Cook, stirring, until the sauce mixture begins to boil. Taste and add salt, as needed. Simmer for 5 to 10 minutes. Add the drained macaroni to the sauce, mix well, and heat through. Serve with warm bread, rolls, or biscuits and a tossed salad or coleslaw on the side. Many pasta shapes can work in this dish. 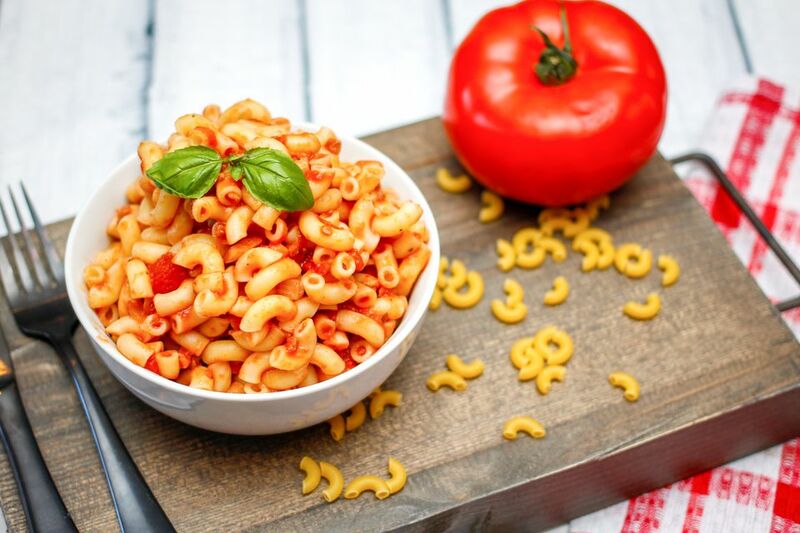 Make it with cavatappi, mini or regular penne pasta, or ditalini. Omit the chopped green bell pepper, if desired. Saute 4 to 8 ounces of sliced fresh mushrooms with the onions. Add 1/2 teaspoon to 1 teaspoon of crushed red pepper flakes for heat.